It’s the entrance, of course, to the parking garage for the Reid Murdoch building. But what most people don’t realize is that, long before it was any such thing, it was the entrance to a tunnel beneath the Chicago River. The tunnel was built in the early 1870s – and became about the only escape route during the fire (though there are reports of flames being sucked into the tunnel, making it a death trap for some of the people inside). Eventually, it was used for cable cars, and then street cars, to get under the river. The city stopped using it when the subway tunnels for the Red Line were dug out, and, since at least the 1950s, the tunnel has been walled up and filled with damp sand. But the entrance is right there, in plain sight. no, this really is the entrance to the streetcar tunnel under the river. see this 19th c postcard. 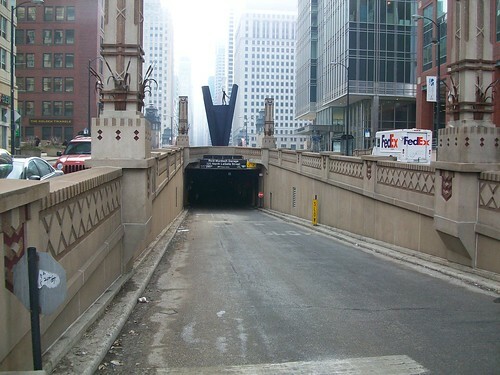 Actually, this is merely the ramp down to North Water Street, built when LaSalle Street finally got a bridge in 1928. The tunnel entrance was in the next block north. A riot we can be proud of!